This approximately 1,350 sq. ft. home rests on 1+ acre with entertaining in mind. A covered porch entry leads you into the open living and dining room with fireplace and picture windows overlooking the large deck, pool, bocce court and horseshoe pit. 3 bedrooms and 1.5 tile baths, an updated kitchen with breakfast bar. Approximately 100+ Sonoma Valley AVA, Cabernet Sauvignon and Syrah varietal vines and a raised bed garden are located at the back of the property and there is an oak bordered meadow. Large, detached 2-car garage has storage and a shop area. The home boasts hardwood floors throughout, large windows with plantations shutters, ceiling fans and a brick gas fireplace. Mature oaks, shade trees and water conscious plants make up the landscaped grounds. Property has been a successful vacation rental; owners are open to including furnishings. Enjoy a central location in the Wine Country with plenty of outdoor space for indoor/outdoor living. 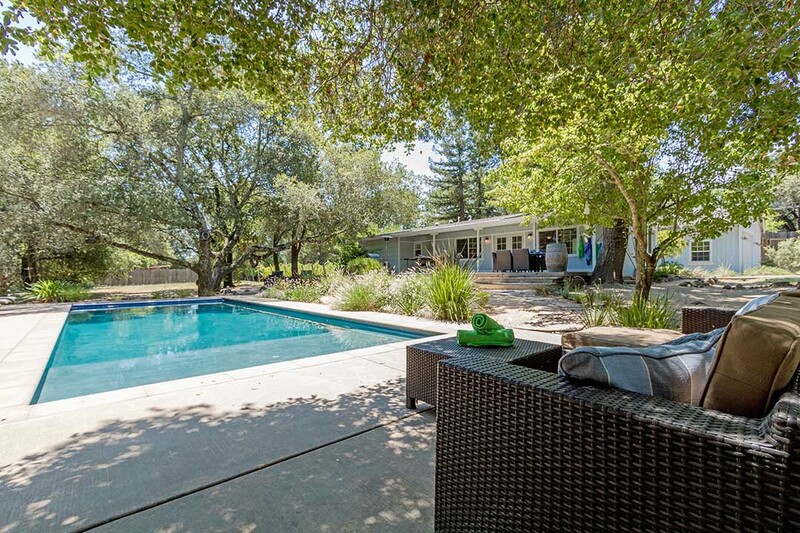 Minutes to Sonoma Golf Club, downtown Glen Ellen and the historic Sonoma Plaza.